Most Americans are now unable to stop eating refined sweets and starches. Most Americans are also experiencing epidemic increases in weight and in health problems like diabetes, heart and liver disease, and cancer. These new weight and health problems are now known to be direct consequences of our increased sugar consumption. Sugar is now thought to be both a highly toxic and a highly addictive substance. See Robert Lustig, M.D. on 60 Minutes and everywhere else in the media over the past two months since his Nature article, “Public Health: The Toxic Truth About Sugar”, stunned the nation. Ross’ book addresses these core issues – how to interrupt our cravings for this hazardous but irresistible substance. Conventional weight loss diets, such as the now popular Dukan Diet, advocate fat- and -calorie restriction, which the typical American overeater cannot sustain for long because of what we know are biologically triggered cravings. Ross eliminates the food cravings first, then she eliminates the unneeded calories from sweets (and any excessive starch) consumption without reducing the consumption of other healthy foods at all. The author releases readers from gorgers guilt by explaining that the brain is the problem, not lack of self-discipline! She then explains how brain-targeted nutrients correct the faulty brain chemistry in 24 hours, as she’s been seeing at her clinic for almost 25 years. The brain and body rely on certain nutrients to regulate appetite and provide pleasure. Dieters, overeaters, and obese people are deficient in these nutrients. Supplying these readily available nutrients as supplements, is the key to eliminating cravings, overeating, and weight gain. Dieting has failed but we don’t know how to replace the yo-yo of under-eating and overeating. Low-cal dieting has no lasting weight-loss benefits because it strips the brain of its appetite-regulating neurotransmitters, which causes rebound cravings and weight gain. 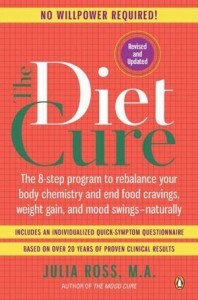 The Diet Cure’s emphasis on eating lots of healthy food (including saturated fat!) helps deprogram the diet mentality. 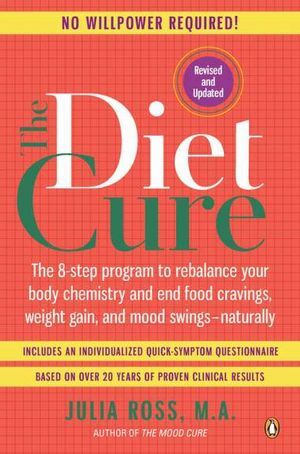 This is badly needed by the “new” dieters who are chronically skipping meals, fasting, doing cleanses, overdoing low-fat, low-cal, caffeine, tobacco, other drugs, and purging in a desperate effort to minimize the damage of uncontrollable sugar consumption. Listen to my interview with Julia Ross here. My life was transformed when I first heard Julia speak as a guest lecturer at my school. I later attended a seminar with her, read the first edition of The Diet Cure, and my growth and healing has reached unimaginable heights. I came across your site shortly before I began reading this new edition of her book. The work that you do is truly an inspiration. After graduating with a degree in Human Nutrition and Food Science, and then frustrated with the limited doctrine of the American Dietetic Association, I went on to do graduate research in biochemistry and neuroscience. I became pregnant, got scared and went back to work full time in order to support my family. You and Julia Ross have helped me ease back into the life that I have always been meant to live, through your work and just by being the incredible, revolutionary women that you are. Knowing that you two are out there, (and connected!!! :)), is special beyond words. Thank you.